If you own one of Apple’s nearly-ubiquitous iPhone devices, you know that they’re capable of handling an impressive array of tasks that simplify both your personal and professional life. What you may not realize, however, is just how much help they can be when your stomach begins to growl. Whether you’re under time constraints that make it necessary for you to find the quickest meal option near you or are determined to find the perfect spot for your big night out, these 10 apps can make finding a restaurant a snap. 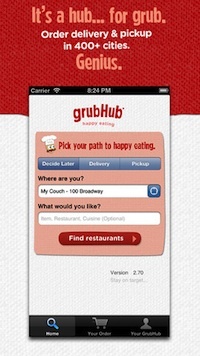 GrubHub Food Delivery & Takeout – If you find yourself looking for restaurants that deliver or offer takeout in your area on a regular basis, this free app may be your new best friend. Browse restaurants in your area and even place your order from within the app, which will save your past orders for quick reordering in the future. OpenTable – The free OpenTable app not only helps you find restaurants near you narrowed by cuisine, neighborhood or price, it also lets you browse menus, reviews and diner ratings while inviting friends along for dinner from within the app. When you’ve settled on the perfect location for your meal, OpenTable will even help you make free, confirmed reservations instantly. Foodspotting – This visual guide allows you to find the foods you’re craving quickly, find out what the food-spotters in your area are raving about and even keep track of everything you try so you can review those dishes yourself! Alfred – Alfred is your free personal robot from Clever Sense, and he wants to learn all about your favorites so he can make personalized recommendations based on them. CNN Money calls Alfred a “Digital BFF,” while TIME Magazine chose it as App of the Week and Apple featured it in their “Great Free Apps” section. VegOut – Vegetarian Restaurant Guide – If you refuse to eat anything that once had a face, you know just how difficult it can be to track down a high-quality vegetarian restaurant. This $2.99 app gives you access to the world’s largest international listing of vegetarian, vegan and vegetarian-friendly restaurants in the world. Happy Hours – Sometimes “restaurant” is code for “bar,” and sometimes you want to hit happy hour for a tipple or two while you wait for your reservation time to arrive. This free app supports most major US cities, and is one of the most exhaustive locally-based happy hour guides out there. Where To Eat? – Finding a great restaurant in your own neighborhood is usually pretty easy. Finding one when you’re in unfamiliar territory, however, may not be. This free app displays the closest restaurants to you from anywhere in the world, even offering turn-by-turn directions to the eatery of your choice. Urbanspoon – A shake of your iPhone while this free app is running will generate a suggestion for you, a great feature for those group meals when no one can agree on where to eat. You can also discover new restaurants, browse filtered results and check in when you reach your epicurean destination. FastFood – Find the best deals, access coupons or promotional offers, look over the menu and peruse reviews to find the best chain restaurant in your area on the double with this free app. NearBy Food – Social networking and geo search engines come together in this $1.99 app, which will provide real-time information based on your current location and directions to a restaurant near you. Part of the appeal that the iPhone and these apps hold is the ability to search out restaurants and businesses near you while you’re on the go. It’s important to keep in mind that finding a place to eat is nowhere near as important as your safety, and that you avoid the temptation to fire up a food-locating app while you’re stuck in traffic. Assuming that your distraction doesn’t lead to an accident, you can still put the money you would spend to pay off a citation for unsafe driving towards a fine meal at a restaurant you choose with these apps while you’re not behind the wheel.